Two global fur trade companies became one through a forced merger, a deal that would have a lasting effect on the fur trade in the Pacific Northwest. On March 26, 1821 two giant companies merged. The Hudson’s Bay Company (HBC), founded on May 2, 1670, bought out its largest upstart rival in the fur trading business, the North West Company. 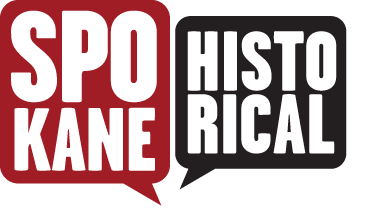 This merger had lasting effects on the fur trade in the Inland Northwest. 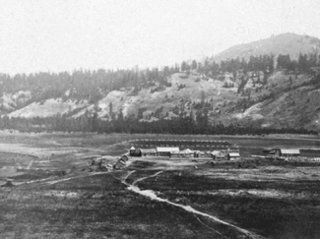 The HBC closed the Spokane House, located at the junction of the Spokane and Little Spokane Rivers, and established Fort Colvile in 1825, named after Andrew Colvile, a director of the company. Fort Colvile became a profitable post. Simpson soon reported "We are glad to learn that Fort Colvile promises to become such a useful Post, both in point of returns and provisions…" By 1837 the company’s farms were producing around 5,000 bushels of grain, the livestock brought from Fort Vancouver continued to prosper, and the fort was a prime agricultural supplier in the interior Pacific Northwest. In Sir George Simpson’s notes of his travels during 1841-42, we find that a "grist mill, which is driven by water, is attached to the establishment." 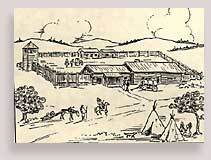 By the 1840s the fur trade was in decline, yet Fort Colvile remained open. Not until the Oregon Treaty of 1846 did the fort finally fall under American jurisdiction, but the fort stayed in business. Only in 1871 did the Hudson’s Bay Company abandon the post. Angus McDonald, the last chief factor of Fort Colvile, continued to occupy the buildings. McDonald homesteaded the fort for a couple years despite efforts to get rid of him. Angus and his son Donald had farms at the old fort until 1907 when Donald moved to Montana. The old buildings of the fort were destroyed in a fire in 1910, but the structural outlines and some old farming plots can still be seen today when the waters of Lake Roosevelt fall during the spring draw down. Ryan Yetter, “Fort Colvile,” Spokane Historical, accessed April 24, 2019, https://spokanehistorical.org/items/show/687. 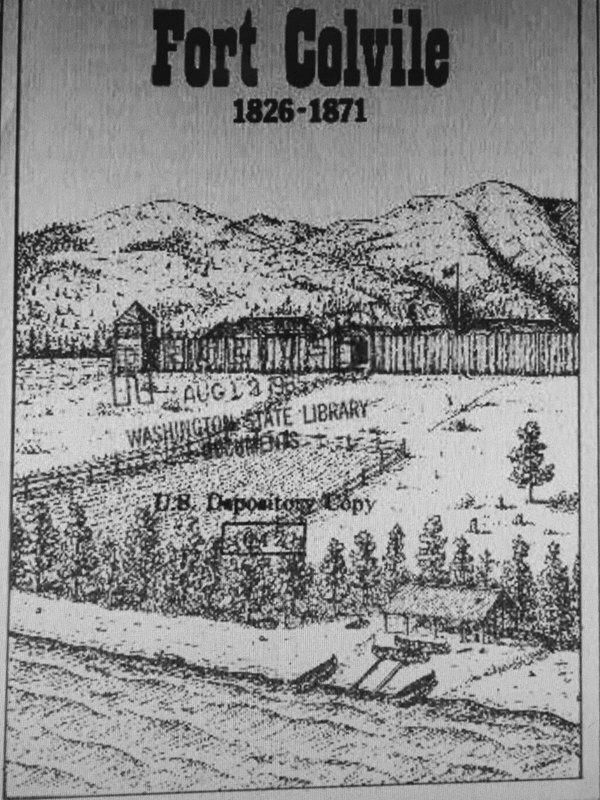 Washington State Digital Archives; Legacy Washington archive, Fort Colvile Pamphlet, https://www.sos.wa.gov/legacy/publicationsviewer/?title=Fort%20Colvile%2C%201826-1871&ID=118. Washington State Digital Archives; Legacy Washington archive, Territorial Timeline photo credithttps://www.sos.wa.gov/legacy/timeline/detail.aspx?id=160. J. Orin Oliphant. “Old Fort Colville.” The Washington Historical Quarterly 16. No.1. http://www.jstor.org.ezproxy.library.ewu.edu/stable/40475480?seq=3#page_scan_tab_contents. 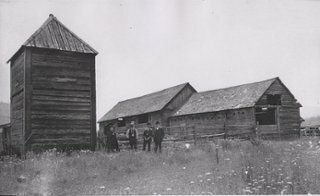 Hudson Bay Company Heritage site, http://hbcheritage.ca/content/timeline. T.C. Elliot. “Journal of John Work, June-October, 1825.” The Washington Historical Quarterly 5. No.2. http://www.jstor.org/stable/40474327?seq=33#page_scan_tab_contents.